The 2010 Urban and Regional Public Transportation Conference, held May 5 at The Westin Hotel and sponsored by the European-American Chamber of Commerce, featured presentations by over a dozen industry experts including a keynote speech by John D. Porcari, Deputy Secretary of Transportation of the U.S. Department of Transportation. “America’s rail infrastructure is in shambles”, said Parcari, whose department is shifting policy away from a decades-old process that considered road or rail projects individually but could not easily approve multimodal projects. In working to rebuild “the squandered investments of our grandparents”, Parcari described a profound turnaround in federal transportation policy from one that encouraged sprawl to one that will promote walkable smart growth. He promised that America’s new generation of passenger trains will not be assembled here from components manufactured overseas, but rather be “100% American” in order to “capture every piece of the high speed rail value chain”. Although the announced policy changes portend an increased opportunity for federal assistance for local rail transit projects, Parcari stressed that in the short term those places with their “act together” will be first to benefit from these changes. Speaking on the matter of the $400 3C’s grant, Matt Dietrich, Executive Director of the Ohio Rail Development Commission, remarked that early in the planning of the 3C’s line, Amtrak offered to sell Ohio a variety of retired and surplus locomotives and passenger cars for $10-$15 million. But after grants were awarded to projects in other regions, that equipment has been directed elsewhere, and Ohio has now budgeted $175 million – almost half of the 3C’s grant – for new passenger trains. 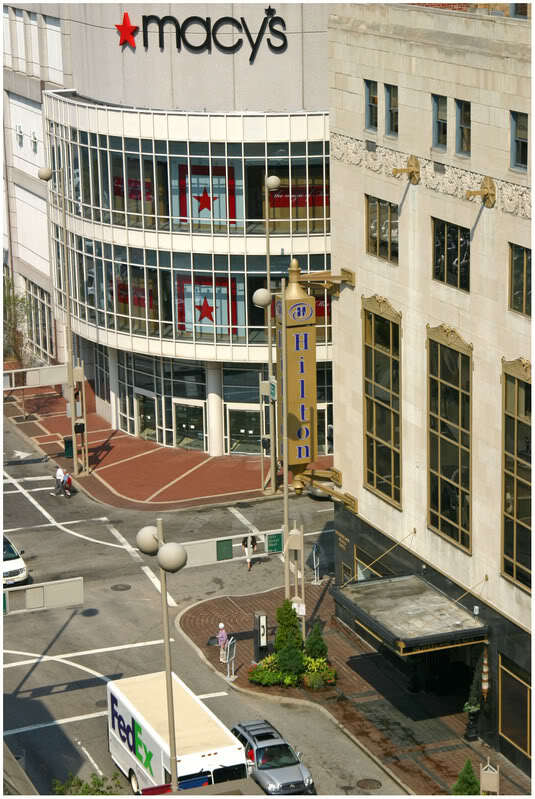 The constricted budget means grant funds are presently unavailable for construction of a track connection to Cincinnati Union Terminal. A permanent suburban station is planned for Sharonville and a temporary terminal station is planned for Cincinnati in Bond Hill. Cleveland’s station will be located on that city’s lakefront, with a convenient connection to its Waterfront light rail line. Both Dayton and Columbus will have stations located in their respective downtowns. Dietrich also discussed plans for a station at Wright-Patterson Air Force Base, possibly within walking distance of the National Museum of the United States Air Force. The base is the state’s largest single-site employer and the museum is, aside from King’s Island and Cedar Point, the state’s most popular tourist attraction. 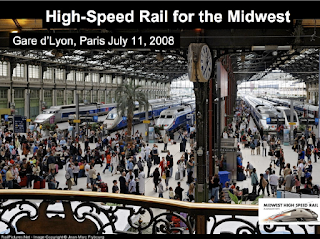 The conference also featured speakers from France, Spain, Germany, and England, each of whom discussed not only the technical aspects of their high speed trains, but also how their networks are funded and administered. Tom Stables, Senior Vice President of Commercial Development for First Group, discussed how England awards franchises to approximately a dozen different companies who for periods of seven to ten years operate the county’s various commuter and intercity train lines. Juergen Wilder, representing industry giant Siemens, described how a ticketing and revenue sharing agreement was achieved with Lufthansa after a high speed rail line extended to Frankfurt’s airport drew significant patronage away from the airline. 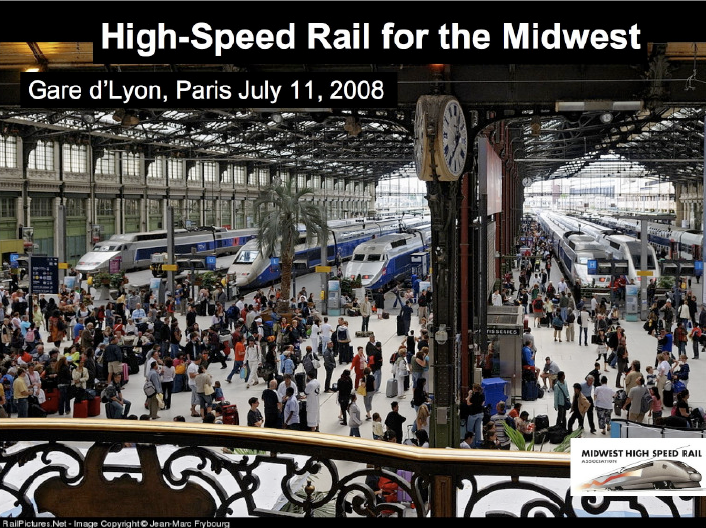 In the face of competition from passenger rail, Wilder suggested that American carriers might seek similar arrangements or even bid to operate the country’s envisioned high speed rail lines. Herve Le Caignec, representing SNCF, the company that operates the French TGV network, discussed attempts at private-public partnerships in the construction of new TGV lines. He also offered evidence of the TGV’s staggering success – every day trains seating 750-1100 passengers leave the French capital bound for Lyon and Marseilles every five minutes and do not just sell out individually, but all trains – more than 300 of them -- often sell out each weekend as Parisians escape their drizzle and migrate en masse to the Mediterranean coast. According to event organizers, guests will be able to sample four different Dogfish brews that will be paired with selected cheeses and accompanied by Morton's Petite Filet Mignon sandwiches, Tuna Tartare Canapés, Smoked Salmon Wedges and Lamb Chops with Brie. There will also be a beer specialists on hand that will give a short presentation on each beer being sampled. The four Dogfish brews being sampled include their Midas Touch, Raison (Belgian Ale), 90 Minute IPA and Palo (Brown Ale). The 90 Minute IPA is one of Dogfish's most popular selections and has been identified as the "Best IPA in America" by Esquire Magazine. The four beer selection will offer a variety of tastes and styles though ranging from the simplicity of the Midas Touch to the complexity of flavors found in the Palo and Raison. Tickets for the Hoppy Hour this Friday at Morton's (map) cost $45 which includes your beer samplings, food, tax and gratuity. Tickets can be purchased now by calling (513) 621-3111. Nearby on- and off-street parking is available along with valet service. Metro bus service is available (plan your trip) along with free bicycle parking on surrounding streets and on Fountain Square. Dogfish Sampling photo by Bubli. Allister Sears, Jake Mecklenborg and Jeremy Mosher gathered various pieces of their video and photography work highlighting Cincinnati's unique cityscape this past Friday, April 30 at the first-ever UrbanCincy Visual Showcase. The temporary exhibit drew around 100 or so people throughout the Final Friday Gallery Hop, and guests were treated to the work of these local artists. Cincinnati has been making bold efforts recently to establish itself a more bicycle friendly city. New bike lanes, sharrows, on-street bicycle parking, bicycle parking development requirements, a bike share program, a bicycle commuter station and a bold new Bicycle Transportation Plan are all helping to change Cincinnati's bicycling community for the better. So far, the City's Department of Transportation & Engineering has made bicycle infrastructure improvements in several city neighborhoods including Clifton, University Heights, O'Bryonville, Walnut Hills and Northside. City officials hope that the new bicycle infrastructure and public policy will double the number of people bicycling regularly for transportation in five years. Many local bicycling advocated believe that some of those future improvements need to start happening now. "We're urging the City to immediately begin putting bike lanes and other improvements in place on Riverside Drive, Madison Road and Spring Grove Avenue," stated Gary Wright, President, Queen City Bike. "Those three streets must be a critical part of any serious bike network in the City, and doing this now will show that this is not a plan that will sit on the shelf." Of those three streets Wright mentioned, Madison Road is scheduled to be repaved this year making for a perfect opportunity to install bike lanes at the least possible cost to a major transportation route between eastern neighborhoods like Hyde Park to the center city. Wright adds that Spring Grove Avenue runs right through the epicenter of Cincinnati's bike culture in Northside and that additional investment along Riverside Drive could bolster that corridor from the popular recreation route it is now to something much more. "Adding bike lanes now and making other changes to slow traffic through the East End community will encourage more people to give street riding a try while also doing a lot to enhance the neighborhood," Wright explained. "Bike lanes along Riverside will not serve as a substitute for completing the Ohio River Trail, but they will also make the Little Miami Trail connection planned for Lunken more accessible to a few more riders right away." Following eight months of surveys, open houses and on-the-street focus groups, the City is ready to release a draft of the plan and receive final comments from the public. The release of this plan will take place on Wednesday, May 5 from 6:30pm to 8:30pm at the Clifton Cultural Arts Center (map). The Bicycle Transportation Plan calls for additional infrastructure improvements, educational and encouragement efforts, and enforcement programs. Those interested in providing feedback may do so by contacting the City with comments online or by calling (513) 591-6000 prior to Friday, May 14th. 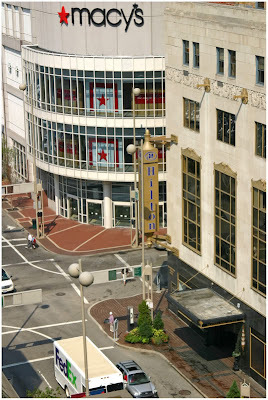 If Cincinnati is our home, then downtown is akin to our city’s kitchen. Downtown is where we, as a community, watch television (Fountain Square), downtown is where we eat, and downtown is where we complete our financial transactions. This is the analogy Mayor Mark Mallory used at the 2010 State of Downtown meeting held this past Thursday, April 29th. The meeting, which lasted for just a little over an hour, also included remarks from the Senior Regional Officer of the Cincinnati/Cleveland Branches of the Federal Reserve Bank Dr. LaVaughn Henry, Hamilton County Commissioner Greg Hartmann, Cincinnati City Manager Milton Dohoney, and DCI president David Ginsburg. The speakers focused on the importance of economic development in the greater downtown areas, each bringing a different viewpoint to the podium. Commissioner Hartmann spoke briefly about the importance of downtown to all of Hamilton County and the region, while using the casino development as a prime example of how to get the public excited and involved in the development process. Dr. LaVaughn Henry addressed the national economic recession and stated that while unemployment is still high here in Cincinnati and across the country, the rate of job loss is slowing and consumer confidence is on the rise. 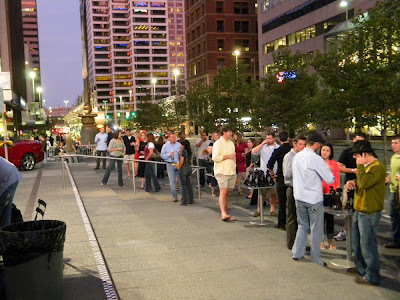 Downtown Cincinnati's population has experienced steady population growth since 2005, and is expected to double by 2012 with the continued renovation of Over-the-Rhine and the opening of The Banks. City Manager Milton Dohoney stressed the importance of taking risks, while also being cautious in our approach. His remarks on economic development revolved around the creation of new jobs, smarter land use, and partnership and investment in our community. 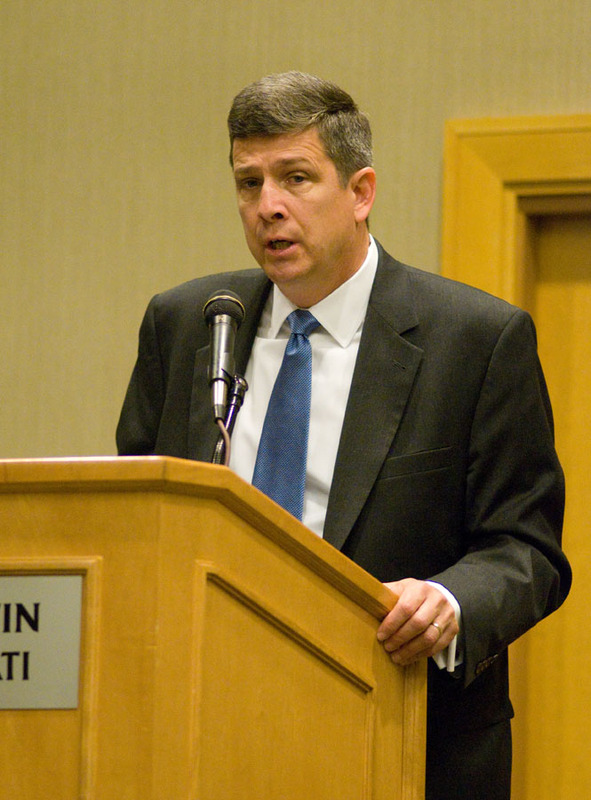 Following the meeting, UrbanCincy caught up with DCI President David Ginsburg where he discussed the importance of projects like The Banks and the Broadway Commons Casino ultimately not becoming a single destination. Ginsburg also brought up the importance of “zoning flexibility” when it comes to downtown vacancy issues.